What is the anatomy of the big toe? What are turf toe symptoms and signs? When should I seek medical treatment for turf toe? How do dcotors diagnose turf toe? What is the turf toe treatment? When is surgery needed for turf toe? What follow-up care is needed after foot pain is treated? Is it possible to prevent turf toe? What is the prognosis for turf toe? What is the recovery time for turf toe? Turf toe is an injury to the underside of the big toe and joint at the base of the big toe. This joint, the first metatarsophalangeal (MTP) joint, is commonly known as the "ball of the foot." Turf toe is specifically a joint sprain of the big toe. The sprain may involve damage to ligaments, tendons, or bone separately or in combination. The sprain, often is a result of playing on artificial surfaces, was first documented in American football players in 1976. Turf toe was recognized as a common injury soon after the invention of AstroTurf in 1964. There are varying degrees of severity of the sports injury. While sometimes mild, which injured athletes can play through, turf toe is sometimes a more serious health condition and can be career-ending. The amount of damage to the ligaments, tendons, bones, and surrounding tissues determines the severity of the injury. Though often referred to as a ligamentous injury or sprain of the MTP joint, the tendons may be strained and bones may be fractured. American football players such as Tom Brady and Deion Sanders and soccer great George Best are among the notable athletes to have suffered from this sports injury. The first MTP joint is a hinge joint with sliding and rotational components. There is also a set of paired sesamoid bones underneath the base of the big toe. There are nine ligaments that span the joint, which is covered by a capsular ligamentous balloon-like structure that helps holds the synovial fluid that lubricates the joint. The primary movers or muscles that move the joint of the MTP are the flexor hallicis brevis. Flexor hallicus longus are the muscles that plantar flex or curl the big toe; contraction of the extensor hallicus longus and brevis lift the toe and important muscles in normal foot function. The primary movements of the joint at the base of the big toe are flexion and extension. The toe is also capable of being moved closer to and away from the foot. Turf toe commonly occurs as an athlete tries to push off of the ground, causing a stretch or hyperextension injury to the structures on the bottom of the big toe. In a 1993 survey of 80 National Football League players, 36 players reported that they had incurred a turf toe injury and 83% of those players reported that the injury had occurred on artificial turf. Older players and those with more experience in professional football were more likely to have sustained a turf toe injury. Turf toe injury does cause a lasting decrease in first MTP motion and increased plantar foot contact pressures in football players. Turf toe, foot, and/or toe pain (metatarsalgia) may also be caused by plantar fasciitis, arthritis, contusions, blisters, bunions, neuromas, sesamoiditis, hammertoes, fractures, and gout. Injury to the bones and joints of the foot can be caused by a single blow or twist to the foot or also by repetitive trauma that can result in a stress fracture. A blunt-force injury such as someone stepping on your foot may result not only in a bruise (contusion) injury but also damage to the muscles and ligaments of the foot. Direct blows to the foot can cause bruising, breaking of the skin, or even fracturing of bones. 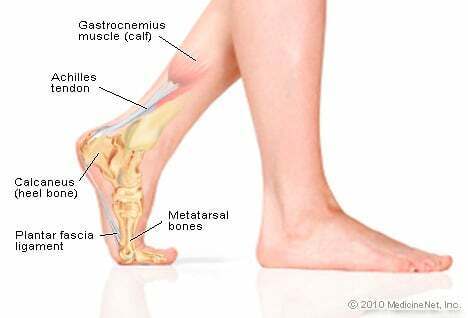 Metatarsalgia is from the repetitive irritation of the joints of the ball of the foot. The term "stone bruise" is commonly referred to as a specific localized pain and tenderness of the ball of the foot. "Turf toe" is a common athletic injury in which the tendon under the joint at the base of the big toe is strained. Trauma to the toenail can cause pooling of blood under the nail and the temporary or permanent loss of a toenail. Repetitive trauma to the bones, muscles, and ligaments can result in extra bone growth known as spurs or exostoses. Turf toe usually has a traumatic sudden onset; most athletes suffering from this sports injury will recall exactly when and how the injury happened. An athlete who suffers from this condition may complain of pain around the ball of the foot, particularly on the bottom or plantar surface of the metatarsophalangeal joint. Depending on the severity of the injury, this pain may be present with or without movement, when the toe is bent up toward the body (dorsiflexion of the great toe), or in the toe off portion of the stance phase of gait, and/or against isometric resistance. Intra and/or extracapsular swelling of the joint may be present. Reduction of strength and range of motion is also seen in acute and chronic ranges of motion. Pain and loss of function of the joint and tissues around the joint may cause difficulty walking and maintaining balance. A good general health guideline is to compare the injured side to the uninjured side. The injured tissues may cause a lump or gap or a "crunchy" feeling at that location from the inflammation. There is typically tenderness and there may be warmth, swelling, and discoloration. If the pain and discomfort interferes with one's activities of daily living or if someone cannot perform his or her desired activities without pain, he or she should consider seeking medical attention from a doctor. Seek medical advice if the area looks deformed, if there is loss of function or change in body movement, change of sensation, a large amount of swelling with pain, prolonged change of skin or toenail color, or if the affected area becomes warmer than the surrounding areas and becomes exquisitely tender to the touch. Turf toe is diagnosed clinically from the health history and physical examination. Athletes who suffer from turf toe will often describe it as having their foot or their toe getting "stuck" on the ground at the same time they move forward. The American Association of Orthopedic Surgeons says that the common mechanism of injury is to have the big toe or forefoot stuck on the ground as the heel raises and the foot is extended or plantar flexed. X-ray and/or MRI testing is sometimes used to support the diagnosis and rule out fracture. The doctor will ask several questions to determine how the problem began. It can be helpful for the patient to tell the physician about how and when it occurred, how it affects him/her, when it bothers him/her, and what he or she may (or may not) have done to make the pain better or worse. The medical practitioner will examine how the patient's MTP joint functions. These tests may involve holding or moving the toe against resistance. The patient may also be asked to stand, walk, or even run. The nerves in the foot will be tested for injury. Knowledge of the location, intensity, and aggravating or relieving conditions helps the physician and physical therapist to determine the cause of the pain and stage of injury. Acute management of turf toe injuries includes rest, ice, compression, and elevation (RICE). Immobilization will allow the affected tissues to begin to heal without stressing the joint. Ice will help to manage the discomfort and reduce swelling, while compression will aid in stopping bleeding under the skin surface and prevent fluid accumulation in the joint and surrounding areas. Elevation will drain and prevent fluid from accumulating in the joint. Over-the-counter (OTC) medications can help to manage pain and inflammation from the injury. A physician may prescribe stronger medications for inflammation. Once the severity and cause of foot pain is determined, a course of corrective and rehabilitative actions can be started. Goals of treatment include pain management, increasing muscle strength and range of motion, maintaining cardiovascular conditioning, and re-establishing neuromuscular control. The following treatments and exercises are instituted at the appropriate phases of recovery. Various stretching and strengthening exercises and techniques are gradually added. Rehabilitation will likely include exercises to maintain and improve the range of motion (ROM) of the joint; strengthening exercises of the small muscles of the foot along with the calf, lower leg, and core muscles should be addressed; and cardiovascular conditioning often including stationary biking. Substitute for activities that aggravate the pain and soreness. Running causes the body to have repetitive impact with the ground. The use of bicycling, elliptical trainers, step machines, swimming, or ski machines minimize impact and allow the individual to maintain and improve his or her fitness without causing irritation to the injury. The body will create various changes in the natural movement after an injury. A therapist can evaluate these biomechanical changes and help make the appropriate corrections. Prolonged, uncorrected biomechanical changes may lead to secondary mechanical changes that are painful and difficult to correct and may lead to a poor prognosis and possibly a slow or incomplete recovery from the symptoms. Footwear often does not provide enough support for the person with turf toe. Corrective and OTC orthotics may also be of use. In-shoe supports (such as a steel insole), prophylactic athletic strapping or bracing, and a decreased range of motion may be needed. Occasionally, surgery may be necessary to repair or remove scar tissue or loose bodies that are in the joint. There may be follow-up tests, scans, or X-rays. A plan for a gradual return to play begins once the pain is reduced and muscle strength and flexibility are restored. The turf toe injury often occurs as a result or combination of fatigue, muscle imbalance, or stress on a body part at an inopportune moment. Appropriate workloads for the stage of training also help prevent injuries. Injury can be prevented through proper preparation for sports participation. A combination of flexibility, strength, fitness, and dynamic stability may help to prevent injury to the big toe. Appropriate muscle strengthening, cardiovascular conditioning, flexibility, balance, core strength, and posture are major factors in both prevention and prevention of reinjury. Flexibility or range of motion of the toe joints may be indicators of injury. Flexibility is determined by the amount the toe can be flexed actively and passively. Greater flexibility of the foot and ankle lessen the chance of injury. There is no particular exercise or stretch that will prevent the injury. Strength also plays a role. The stronger the body the less susceptible to injury it becomes. One of the keys is that both the muscle that moves the body part through that range of motion and the opposing muscle must also be strong. A decreased range of motion may predispose the joint to injury. Meanwhile, hydration keeps the tissue supple and the muscle working correctly. Unfortunately, there is no magic cure for prevention of turf toe besides developing the components needed for safe participation in sport. The basic guideline to prevent injuries is to determine if one is in good health by having a physical exam to evaluate cardiovascular function and the possibility of disease or any other general medical problems. Before beginning activities, diseases such as gout, diabetes, certain types of arthritis, and neuropathies should be treated. Shoes and socks appropriate to one's activity will also be a deterrent to injury, as proper fitting footwear can help minimize the effect of bad biomechanics. The recovery time for turf toe is dependent on the severity of the injury. The more severe the injury, the longer the recovery time will be. With severe injuries, surgery may be required. Sometimes complete recovery may not occur, leaving the patient with a stiff or arthritic toe. Upon return to activity, various preventative measures such as wearing a brace, athletic strapping (such as with turf toe strips made from moleskin), or insertion of a full foot shoe orthotic or rigid shoe insoles (such as steel plate supports) are considered. Amendola, Annunziato, and Andrea Veljkovic. "Turf Toe." OrthoInfo. American Academy of Orthopaedic Surgeons. Aug. 2012. <http://orthoinfo.aaos.org/topic.cfm?topic=A00645>. Bowers Jr., K.D., and R.B. Martin. "Turf-toe: a shoe-surface related football injury." Med Sci Sports 8.2 (1976): 81-83. Brophy, R.H., S.C. Gamradt, S.J. Ellis, et al. "Effect of turf toe on foot contact pressures in professional American football players." Foot Ankle Int 30.5 (2009): 405-409. Coker, T.P., J.A. Arnold, and D.L. Weber. "Traumatic lesions of the metatarsophalangeal joint of the great toe in athletes." Am J Sports Med 6.6 (1978): 326-334. Rodeo, S.A., R.F. Warren, S.J. O'Brien, et al. "Diastasis of bipartite sesamoids of the first metatarsophalangeal joint." Foot Ankle 14.8 (1993): 425-434. What caused your turf toe? What were your turf toe symptoms? How was your turf toe treated? What measures have you taken to prevent turf toe? Do you know which type of bandage to use with a scrape, poke, blister or burn? Learn the best way to cover or wrap your injury, and get tips on when it is time to see a doctor.